For the most intense attacks of walking dead monsters, a multi functional and deadly weapon will quickly become a necessity. With an apocalyptic appropriate style, the Zombie Slayer Hand Axe will help you hack through the undead army. Made from a solid piece of stainless steel, this blade features fine tooth serration across the top for sawing capabilities, with a pick on the back to aid with hooking and dragging. Neon green paracord is wrapped around the handle, providing comfort and resistance, while a lanyard hole offers convenience. 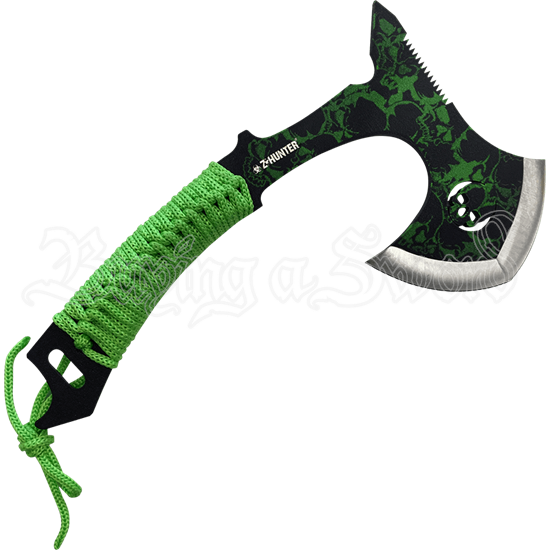 Green zombie skull camo covers the black steel blade, while a zombie skull cutout is a sinister detail. Great for throwing, digging, and piercing, the Zombie Slayer Hand Axe will help keep you and your group safe during the undead uprising.